The DuetWifi and DuetEthernet support up to two daughterboards, with a further two on a Duex2 or Duex5 expansion board, with 4 daughter boards a total of 8 PT100 sensors are supported. Thermocouple and PT100 daughterboards can be mixed and matched. 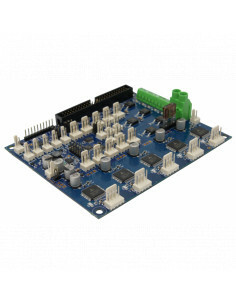 The Duet 2 Ethernet is an advanced 32 bit electronics board for the control of 3D printers and other CNC machines. It has the same features as the Duet 2 Wifi, other than providing ethernet connectivity rather than Wifi, a full feature description is available on our documentation.